The ultimate tribute to commemorate your Veterans service to our country. Perfect to honor our distinguished military service members, veteran Heroes and other uniformed Heroes as police officers and firefighters. This flag case has the Great Seal of the United States embossed on elegant beveled glass. You can choose not to have the Great Seal if desired. If you would like instead, you can select a service specific brass medallion or an etched specialty colored medallion for an additional fee. 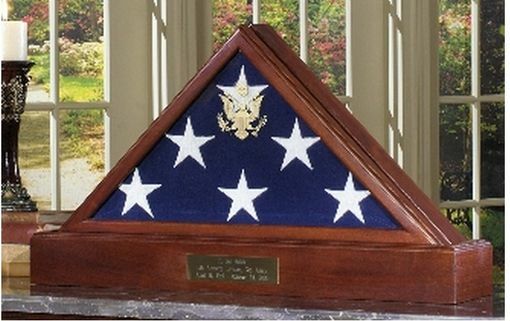 This Presidential Flag Case features a hinged lid, a solid wood finished back panel, concealed magnetic closure and a dust seal to preserve your flag.